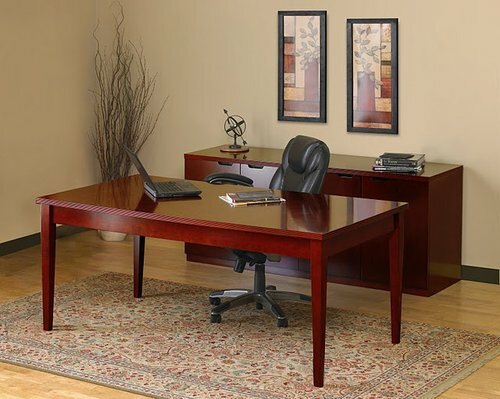 Executive Bow -Front desk in Maplewood – ‘Brand New in-the-box’ real wood veneer, U-Shaped Desk with/or without the 4-door credenza top hutch unit. 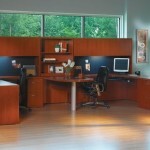 Bow-front desk has (1) locking BBF pedestal. 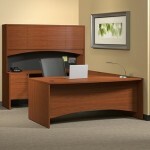 Also available is the matching wood veneer pedestal, for the credenza. These are absolutely gorgeous sparkling new, private office desk sets. We have installed these in some of Corporate America’s biggest companies. Don’t wait, delivery is 3-4 days from order confirmation. Also available in Cherrywood!